This year’s event will host Dr. Giorgio Trinchieri, NIH Distinguished Investigator and Director Center for Cancer Research – National Cancer Institute, NIH (Bethesda, MD, USA). After receiving an M.D. from the University of Torino, Italy, in 1973 and traning in medical genetics, Dr Trinchieri was a member of the Basel Institute for Immunology (Basel, Switzerland) and an investigator at the Swiss Institute for Experimental Cancer Research (Epalinges sur Lausanne, Switzerland) working on the role of the major histocompatibility antigens in cell-mediated immunity and in the characterization of the biology of Natural Killer cells. From 1979 to 1999 he was at Wistar Institute in Philadelphia and became Hilary Koprowski Professor and Chairman of the Immunology Program working on natural immunity and on immunoregulatory cytokines. After spending 5 years in industry as the Director of the Schering Plough Laboratory for Immunological Research in Dardilly, France and being responsible of their cancer immunotherapy effort, he returned to the States as NIH Fogarty Scholar at the Laboratory for Parasitic Diseases, NIAID, before becoming director of the Cancer and Inflammation Program (CIP) and chief of the Laboratory of Experimental Immunology at NCI in August 2006. Dr. trinchieri was one of the founders and presently Associate Director for Laboratory research of the Trans-NIH Center for human Immunology. 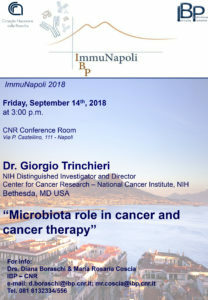 As CIP director, he oversees the operations of a program (with a total 17 principal investigators) that constitutes the major immunologic component of the NCI inflammation and cancer initiative that seeks to partner NCI’s expertise in inflammation and immunology with its cutting-edge cancer etiology and carcinogenesis program. He has been interested for many years in the interplay between inflammation/innate resistance and adaptive immunity, and in the role of pro-inflammatory cytokines and interferons in the regulation of hematopoiesis, innate resistance and immunity. In 1989, Dr Trienchieri’s group at the Wistar Institute discovered Interleukin-12 and its role in tumor immunity, infections and autoimmunity. His main focus of research is now the role of inflammation, innate resistance, immunity and commensal microbiota in carcinogenesis, cancer progression, and prevention or destruction of cancer.